What are the advantages of community solar? Community solar provides members access to a large scale solar array, which gives you, and every member, access to clean solar power – not just homeowners with southern-facing roofs, upfront money to pay for an on-site system, and willing to cover their home in panels. Residential, seasonal and commercial and industrial members of Cherryland, Great Lakes, HomeWorks, Midwest and Presque Isle co-ops are eligible to subscribe (or will be in the near future). Where is the SpartanSolar community array located, and how does the power actually get to my home? The SpartanSolar community array is located on M-55 between Cadillac and Lake City, Michigan. Your panel subscription entitles you to a share of the energy produced by our utility-scale community solar array. The clean energy produced by the solar array will be pushed onto the electric grid, not routed to any specific home. No extra meter is required. Am I actually buying a solar panel? No, you are purchasing a subscription to a portion of the entire solar array and you will receive credit for the solar power generated from that subscription (or subscriptions) for 15 years. What are the methods of subscription payment? Each panel subscription is a one time payment of $600, or $10 monthly for 5 years. How am I reimbursed for the solar power generated from my panel subscription? Your monthly bill credit is $0.10/kWh based upon your panel subscription’s share of the actual solar power generated for that month. Monthly bill credits will be issued the month following the actual generation. No extra paperwork is needed. Credits will begin to accrue beginning on the first day of the month following enrollment. The credits will appear on your bill immediately following the first full calendar month enrolled. Credits will continue to accrue for each full month of enrollment for a total of 15 years (180 months). What can I expect in terms of payback for my solar panel subscription? As with wind generation, accurately forecasting solar output is difficult because of ever advancing technology and the variability of Michigan’s weather. With that said, a single panel subscription in the SpartanSolar community array should produce approximately $40 in credits per year. Monthly credits will vary with the seasons. How many watts per panel subscription? How many dollars per watt does the panel subscription cost? Approximately $1.80/watt. This amount is significantly lower than what it would cost to install panels on your roof (approximately $3.00/watt). How many panel subscriptions would I need to power my entire house? Your local distribution co-op can help you calculate this number, but most households would need about 24 panel subscriptions to power their home using clean solar energy (based on an average of 800 kWh per month). The clean energy produced by the solar array will be pushed onto the electric grid, not routed to your home. How many panel subscriptions can I purchase? There is no limit to the number of subscriptions you can purchase, as long as there are enough subscriptions still available in the community solar array. The SpartanSolar community array has 4,352 panels. Can I cancel my panel subscription(s) if I move or change my mind? Your panel subscription(s) in the SpartanSolar community array can be cancelled at any time and you will receive a refund. How is the refund calculated? The refund is calculated by determining the subscription amount paid and subtracting the amount of credits paid as of the date of termination. What happens to my subscription if I discontinue electric service with my co-op? It will be treated as though you have cancelled it and you will receive the same refund. What are the tax implications of my solar panel subscription credit? Bill credits resulting from solar generation are not taxed. Your panel subscription payments are not tax deductible, nor do they qualify for the 30% Investment Tax Credit. Are any other rebates available? 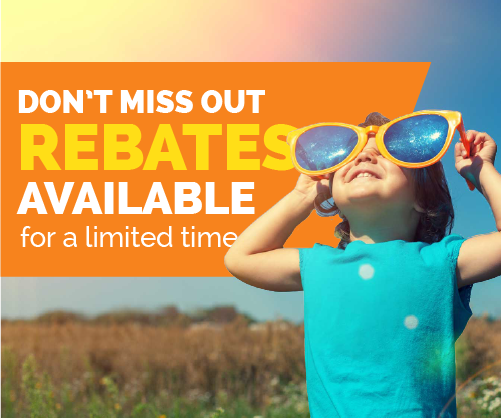 You may be eligible for a rebate. Check with your co-op. How long is enrollment in this program available for? You may enroll in Community Solar until the array is fully subscribed, OR December 31, 2019, whichever is sooner. Do I stop receiving community solar credits once my subscription expires? Can I renew my subscription after 15 years? More information will be provided on renewal options closer to the end of the 15-year term. If you’re interested, but would like to speak with someone or get more information, contact your co-op. For your convenience, phone numbers are listed below.